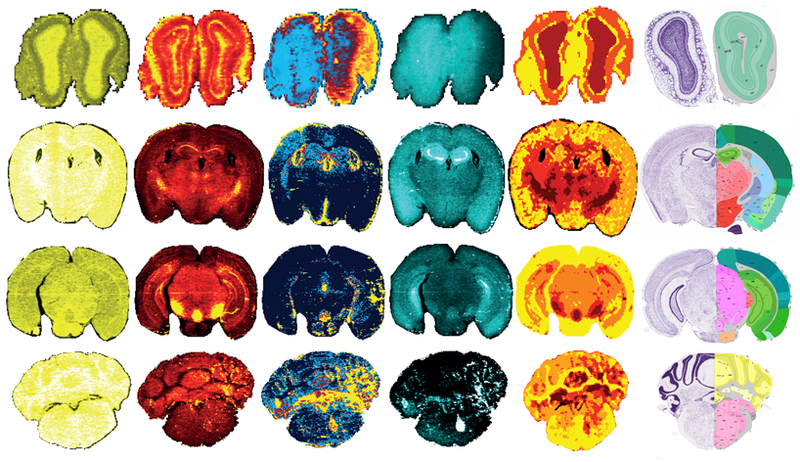 We took a few brains taken from normal, healthy (albeit pretty old, at 16 months) mice, sliced them into regular intervals, scanned a laser across them, and, lo-and-behold, rebuilt models of how metals are distributed throughout the brain. The kicker here is that Bence’s software not only allows us to look at one metal at a time, but also several at once, in three-dimensional space. Take a look at the picture here. Part A shows voxels (pixels with volume) that contain all the elements we scanned for. Part B shows that is we narrow the range to every element except those regions that contain only small levels of zinc, we start to see some clear definition. Part C is the bid deal here, when we want to look at a very specific range, in this case, a narrow range of phosphorus, not much manganese, a bit of iron, no cobalt, practically no copper and relatively high zinc, all of a sudden a very specific brain region comes out – the hippocampus – which controls memory and spatial navigation, and is affected in a range of neurological disorders, such as Alzheimer’s and epilepsy. What’s pretty cool about this, and a bit too technical to get into here, is that not only does this software package (which we call ‘Biolite’) allow us to visualise metals in the three dimensions, it also takes all the guesswork out of how to re-stack and align the cut tissue sections we analysed. Removing any bias from an analytical measurement is super important, and the first time we attempted this (from a Metallomics paper back in 2010), we relied on our own eyes to match each consecutive sections, which was time-consuming and prone to error. Now, with this taken care of, we can move onto the next thing, which is trying to build a standardised map of metals in the mouse (and later human) brain that researc hers can use as a point of reference when studying metals in diseases. 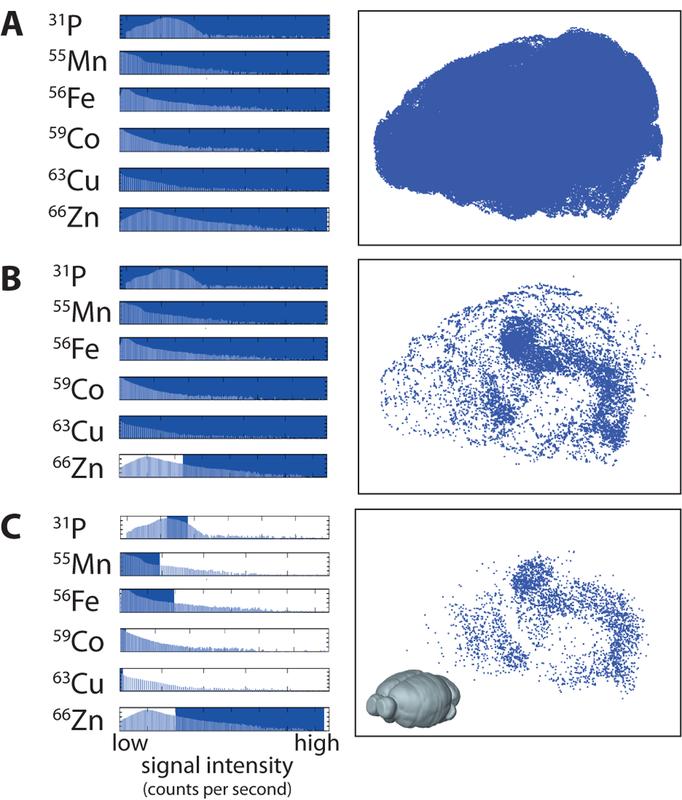 One pretty cool way we’ve taken out bias is by using some fancy maths (in our field called chemometrics) that uses something called ‘fuzzy clustering’ that looks at all the metals we measured and groups them into specific chemical clusters (left). This approach begins to tease out the incredibly complicated architecture of the brain, which consists of some 81 unique regions, all with their own specific function (often more than one). Doing this helps us understand some of the chemical similarities between regions, which can explain in diseases related to metals why they are similarly compromised. The final piece of new info we present in this paper is using metal-tagged antibodies to try and align metal location with function. Going back to our very first post we talked about using gold to tag the enzyme that ma kes dopamine, and we applied that idea here, instead using the metal ytterbium. This allowed us to build a map of dopamine throughout the brain, showing again where high levels of both iron and dopamine colocalise, and that they correspond to regions at risk in Parkinson’s disease. Look to the right, in panel A, we used the Allen Brain Atlas of gene expression to confirm the presence of this dopamine-producing enzyme, finding our method to be much more sensitive (panel B). When looking at high iron (panel C) in conjunction with those areas of dopamine (panel D), one again the substantia nigra pars compacta lights up, as well as, the olfactory (smell) bulbs (the bits at the front). We’re looking further into this now, but, what you might not know is one of the first clinical symptoms of Parkinson’s disease is a loss of sense of smell. Finally, because everything looks better as a movie, check it out here, and see some other videos from this work in the Supplementary Information section to the right of the paper’s web page. ‹ Early life iron exposure: Is it a risk factor for neurodegeneration?